- The course remains extremely challenging and borderline unplayable, with fairways slowing down and greens speeding up. - Tee times have been moved up due to severe weather in the afternoon, with dangerous thunderstorms and wind gusts of up to 40mph likely. The final pairing will go off at 9:00, and storms are expected to arrive between 11 and 1. The Lourennian Golf and Chole Association (LGCA) is trying to get as many holes in as possible, and is still optimistic for a Sunday finish. 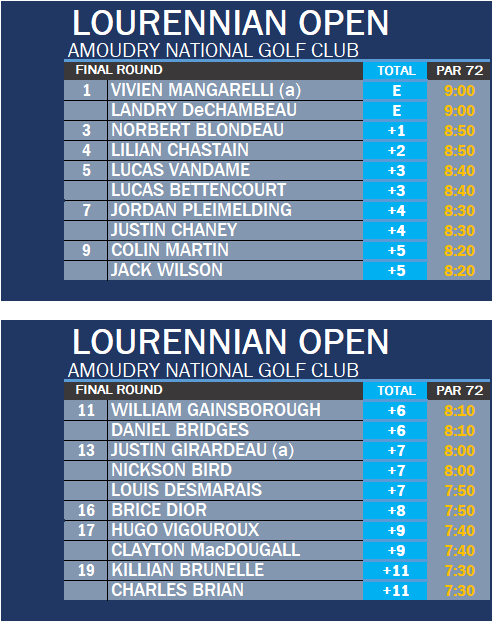 - Tournament host Landry DeChmabeau is among the group tied for the lead at -2. DeChambeau and Norbert Blondeau will go off at 9:00 in the final pairing of the day. The penultimate (8:50) pairing will consist of co-leader Lilian Chastain and amateur Vivien Mangarelli, who starts the day two back at even par and in solo fourth. - Former Mordusian Open champion Daniel Bridges sits in a tie for fifth at +1 in his comeback appearance, while professional handicapped golfer Will Gainsborough sits in a tie for seventh at +2 after tying for lowest round of the day on Friday with a 68; this year's Lourennian Open marks the first professional non-handicapped-only event to include disabled golfers. As of 11:12 Saturday morning, third round play of the Lourennian Open has been suspended due to thunderstorms and dangerous wind gusts in the area. LGCA officials have given up on a Sunday finish for the Open; updated forecasts are suggesting wind gusts and rain will continue until late Sunday, when the final ten groups will finish their rounds. The tournament will conclude on Monday, and any necessary eighteen-hole aggregate playoff will occur on Tuesday. 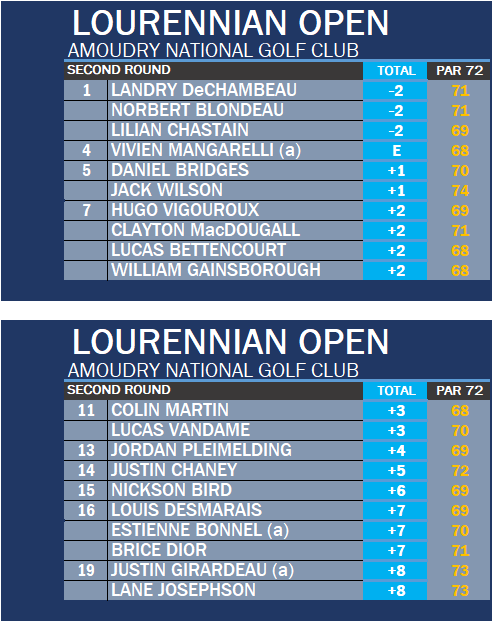 Monday at Amoudry National began early, as 74 players tried to cram in their rounds a day late. On the move early: handicapped golfer Will Gainsborough and a resurgent Daniel Bridges. Gainsborough and Bridges had shot 76 and 77 in the third round, respectively, but were quickly clawing their way back into contention. But it was amateur Vivien Mangarelli, playing in the final pairing with tournament host Landry DeChambeau (decked out in his usual Sunday red cardigan, blue pants, and driver cap), who took the solo lead on the front nine with a hot start. Gainsborough continued to sizzle, carding two eagles in a row at the drivable 15th and par-5 16th to tie Mangarelli at -1. However, a bogey at the 17th put his tournament hopes in jeopardy. He headed to the 18th needing birdie. After his tee shot found the rough, he hit his approach to five feet, receiving a standing ovation from the large crowd as he wheeled himself up to the green. Gainsborough managed to make the birdie putt to post -1 for the tournament. Crowd favorite DeChambeau quickly dropped shots after making the turn in even par for the tournament, and had stalled at +1 for his round and the tournament through 16 holes after a rough par on the par-5 16th. As the final group moved to the 17th tee, DeChambeau would likely need a birdie-birdie finish to have a chance at the title. Mangarelli had already hit his tee shot at 17 to inside ten feet. DeChambeau hit a disappointing 20 feet and had left himself a tough downhill putt. Playing for six feet of break, DeChambeau rolled in the putt with some pace to move back to even par for the tournament. Mangarelli's putt was completely misread and ended up three feet from the hole, all downhill. The amateur rolled in the putt and headed to the last with a one-shot lead over DeChambeau. Both players found the fairway off the tee. Mangarelli played a conservative shot to about 30 feet. It was now up to DeChambeau to put himself within birdie range. His ball rolled to within five feet of the hole, but spun back and ended up at the bottom of a ridge, about 20 feet from the cup. Mangarelli lagged his putt to the hole and tapped in for par to post 1-under 287 for the tournament. DeChambeau wasted no time hitting his putt. It rolled halfway around the cup and trickled in, prompting a huge celebration on the green. There will be a three-way 18-hole playoff on Tuesday morning. After all three players made the turn in even par, Mangarelli unleashed three birdies in a row on the toughest stretch of the golf course to take a two-stroke lead. Both Gainsborough and DeChambeau eagle 15, while Mangarelli can only manage par. Gainsborough follows with another eagle at 16 to take a share of the lead with Mangarelli. DeChambeau nearly aces the par-3 17th, but makes the birdie putt. All three are tied heading to the home hole. Mangarelli hits his approach into the rough, but gets up and down for par. Gainsborough two-putts from 25 feet. DeChambeau's approach finds the left bunker. He elects to flop it. The ball comes out perfectly and one-hops into the hole.